A bit of a warning before you scroll down too far. This article depicts photos from the Chauchilla Cemetery just outside of Nazca, Peru. 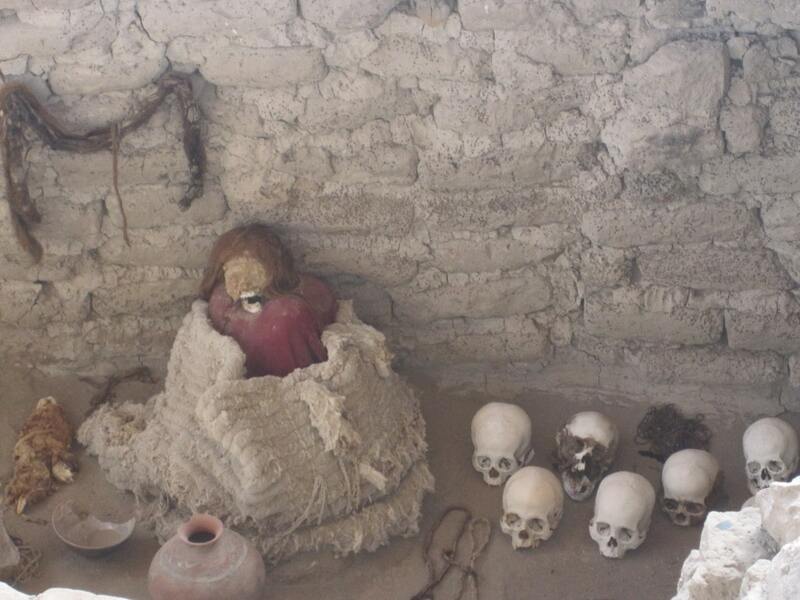 The photos are of human remains, some which still have hair, eyes, and skin on them. They may be considered graphic, so check them out at your own accord. The Chauchill Cemetery is an ancient grave dug up by grave robbers. 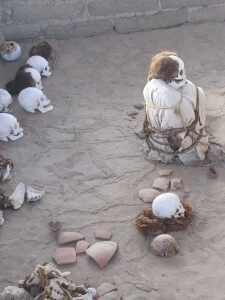 The desert that encompasses the Nazca region of Peru is the second driest in the world. It is desolate and raw. It can be easy to see how, when left alone in this barren wasteland of rocks and shrubs, people could be worried about becoming skeletons on the desert’s dry soil. However, many would not expect to see an open burial site, holes seemingly randomly placed in the middle of the desert which dip between three and six feet deep. One would not expect to see full skeletons sitting comfortably at the base of these tombs, many of the tomb’s inhabitants still with hair, skin, and in some cases eyes. This is the Chauchilla Cemetery. Pre-Inca societies that once existed in this arid flatland. One of the more interesting sites is the Chauchilla Cemetery which sits about 30 minutes down the Pan-American Highway from the city of Nazca. 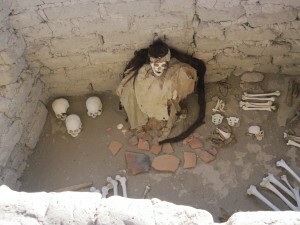 Chauchilla Cemetery is said to date back nearly 2000 years. Over a hundred of tombs sat here at peace for thousands of years until grave robbers dug up the site in search of the silver, gold, and pottery that was left at the sides of the buried residents. The grave robbers were left with nearly the same experience as encountered by visitors today. 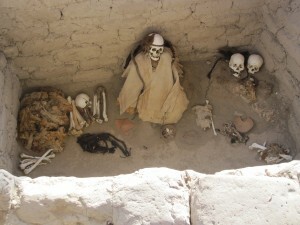 The bodies that sit in the graves have been well preserved due to the dry conditions of the desert. Many of the bodies still maintain their skin and eyes even after thousands of years of existence in the desert. The eerie sight of these corpses becomes even more real when you realize that the wet earth that sits at their feet is not the results of rain, but rather the remains of the occupant’s bodily fluids. Moreover, the graves are not reserved for adults only, but there are also young children, and even babies wrapped in clothes of cotton. The bones too are not only kept in the tombs, but also strewn across the desert floor itself. It is not uncommon to see a human femur laying openly on the rough desert floor, or to notice the fragments of bones stuck in between your toes as you walk across the site in light sandals. viewers of ancient Egypt without the restrictions of museums. And although visitors usually breeze through town after a quick trip to the lines, those who stop here will surely be left with a story to tell, a few good pictures, and, maybe, some nightmares for a couple sleeps beyond. That IS a strange site! Thanks for sharing those great photos. Fantastic article Brendan, it really does go to show what you can find if you go off the beaten track a little. The photographs are amazing although also a little disturbing! Wow, interesting. I came upon many macabre sites in Europe, sometimes unexpectedly, and it is really interesting to see how past cultures dealt with death. Great photos! Gotta go see this place next time. Thanks for the fun read!